The next general meeting will be at 7:00 pm on Wednesday March 28th at the Edmonds Senior Center, 220 Railroad Ave. Edmonds, WA 98020. The presentation this month will be by the Edmonds-Woodway High School Students Saving Salmon Club. The will give us an update on their activities around the Edmonds area working to improve streams for salmon habitat and other related activities. They have also been working with the Sound Salmon Solutions group that is taking over the everyday operations at the Willow Creek Hatchery. We will have a quick update from them with regard to who they are and how they intend to use the hatchery in a very similar pattern (education and enhancement) we have for the last 40 years. We will have our next General Meeting on Wednesday April 26th 7:00 PM at the Edmonds Senior Center 220 Railroad Ave, Edmonds, WA 98020. Our guest at this meeting will be Rodney Pond from Sound Salmon Solutions. He will be discussing their plans for taking over the operation of the Willow Creek Hatchery at some point in the future. They are a non-profit group that has as their goal: "to help salmon return to our watersheds. Through interactive education, hands on stewardship and state of the art habitat restoration we nurture the relationships between people and our wild spaces to support salmon recovery". They are a large energetic group that will be able to continue the work we began nearly 30 years ago. We will have a raffle and refreshments. We also need to assemble a list of volunteers who would be able to help out with our Annual Open House that is part of the Waterfront Festival the weekend of June 3rd and 4th. You can volunteer for morning or afternoon shifts each day to help with the fish pond, cleaning fish, working on the popcorn and juice table or showing people around the hatchery. Email to: edmondstu@gmail.com if you are able to help us out and which day and shift you can come. We will have our next General Meeting on Wednesday November 30th 7:00 PM at the Edmonds Senior Center 220 Railroad Ave, Edmonds, WA 98020. We will be discussing the activities for the next year including launching the net pen after a years absence because of the work being done at the Edmonds Fishing Pier. We will also have elections for the Board of Directors for 2017. If anyone is interested in helping out on the board please plan to attend and make sure you let us know you're interested. Our next General Meeting will be at 7:00 PM on Wednesday September 28th at the Edmonds Senior Center, 220 Railroad Ave, Edmonds, WA 98020. The meeting will include a special presentation on the Kokanee restoration project in the Lake Sammamish watershed and updates on what's happening in the chapter. Jim Bower of King County and David Kyle of Trout Unlimited will be discussing native kokanee in the Lake Washington Basin, especially the Lake Sammamish watershed. Topics will include current population trends, ongoing restoration efforts, what we understand from historic accounts including pre- and post- construction of the ship canal, and what has led to the decline in this population between the 1920s and early 2000s. Jim Bower is a fish ecologist with King County and David Kyle is Trout Unlimited’s Lake Sammamish Kokanee Restoration Project Manager. We are having our open house this weekend at the Hatchery @ 95 Pine Street with a Fishing Pond for Kid's Trout fishing age 12 and under. Admission is free. 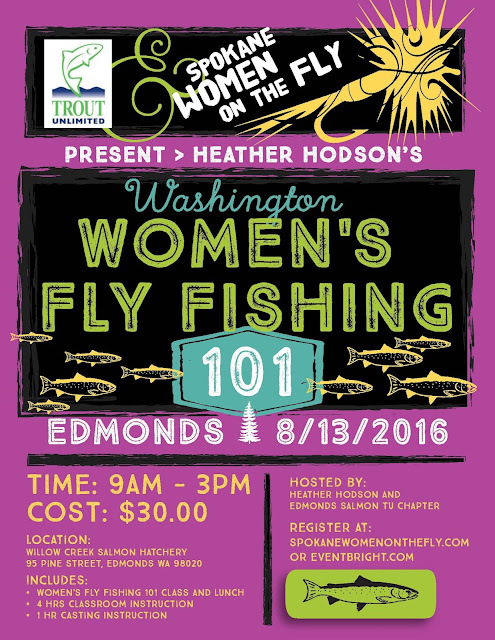 There will be tours of the hatchery and you can feed the coho remaining in the pond. We will be open each day June 4th and 5th from 10:00 am to 4:00pm. The Edmonds Salmon Chapter of Trout Unlimited is hosting a presentation by Jeff Duda, who is a research ecologist for the US Geological Survey’s Western Fisheries Research Center in Seattle, WA. The topic will be: After decades of debate, planning, and environmental impact studies, the largest dam removal project in U.S. history was conducted on the Elwha River in Washington State, USA, from 2011 to 2014. The story of this river, with rugged headwaters, protected wilderness, legendary and culturally important salmon runs, and two hydroelectric dams whose placement marshaled wholesale socioeconomic and ecological changes, has become an iconic saga of change, perseverance and renewal. The two dams blocked fish migrations and disrupted sediment transport for a century, disrupting the structure and function of the Elwha River. Removal of the 210’ and 105’ tall dams and the release of a large portion of the 27.5 million cubic yards of stored reservoir sediment, has provided a living laboratory to study the patterns, processes and outcomes of dam removal from multiple scientific perspectives. This presentation will provide a tour of what has been called a “Science Disneyland”, share progress on the rebirth of a river ecosystem, and place this project into a larger perspective of dam removals and river restoration in the 21st century. The Meeting will be held at the Edmonds Senior Center on April 27th at 7:00 PM. The Center is located at 220 Railroad Ave, Edmonds, WA 98020. The meeting is open to all those interested in hearing about this very interesting and important project. >>on the Edmonds waterfront 2 blocks south of the ferry terminal.